Anyone who has ever played a euro board game knows that they tend to use abstract victory points as a win condition. Whoever has the most of them wins at the end of the game. These victory points (or VP) also tend to be useless during gameplay, only mattering at the end of the game (this is why money in Monopoly is not a type of Victory Point). They usually come from multiple different sources in the game (which makes the game more interesting as you can choose to pursue any of these sources), and they rarely go down; usually they just count up. It's a natural desire to know how you're doing during the game: to want to see how many Victory Points you have versus how many VP your opponents have. While games can do this well (and I will discuss them below), public VP has one huge drawback - is the disengaging problem. As we've mentioned before, one of the designer's major jobs is to make sure no player disengages during the game, and the biggest contributor to a player wanting to quit is being sure that they are going to lose. Obviously, when you can compare your score to your opponents' scores at any time it's easy to lose heart. The easy solution to visible scoring problems is just to hide players' scores to their opponents. This can be done pretty easily by having players store their VP chips face down, or behind a screen, or yield Victory Points based on meeting conditions on hidden cards - the player can check her total at any time, she just doesn't know how many points her opponents have. Hidden scoring is not without its issues, either, however. The biggest problem is players feeling lost, as they have no idea how they are doing compared to their opponents. This usually matters most for new players, as they don't have previous play-throughs to use as benchmarks (for example, I know that 10 victory points a turn in Small World is pretty good, so I don't need to see my opponents' score increases to know I'm doing well). The second issue with hidden scoring occurs when players cannot see their opponents' score totals, but they can see how many points those same opponents are getting every turn (which happens in almost every game that has hidden scoring). This doesn't bother everyone, but it bothers me, because I feel like if I were better at the game or more motivated I would memorize how many points my opponents have gotten and thus know their totals. I dislike the cognitive dissonance that this produces. There are a whole bunch of "solutions" for this problem that work in practice, but I find fairly inelegant design. For example, the method of having visible score, but trusting that the math to calculate or predict final score in the middle of the game is daunting enough to keep people from figuring out how many points their opponents have. It's worth mentioning, before I go on to the elegant solutions, that a game that has purely visible score, a game that has hidden score, or a game that uses an inelegant solution is not necessarily a bad game; many good games use one of these methods effectively! That said, it's good design practice to consider whether your game could benefit from one of these more elegant methods of controlling players' knowledge about scoring. Nearly all the elegant solutions are a play on a central concept: visible base score, with a reveal occurring at the end of the game to yield players a potentially large bonus of points. This archetype solves both of the core issues with pure visibility and pure hidden scoring. Players can get a sense of how they are doing with the base score, but they needn't worry if they're behind early in the game, as the reveal could end in a massive swing in their favor. Players' scores change in every game. Duh. In some games, however, the players have enough choice that predicting major score changes becomes nigh on impossible. In The Year of the Dragon is one of these games. As I've mentioned before, the game is based a series of events where players usually make choices to either prepare for the events properly ahead of time, or sacrifice the characters they've recruited, or some mix of both. Players accrue points purely visibly throughout the game, but at the end players get additional points based on how their engine is built. Because the events make players engines change drastically throughout the course of the game, the core problem with visible scoring is nullified; since it is basically impossible for players to predict the state of their opponents' engines two turns in the future, they can't be sure how their opponents are going to do during the end game scoring. This kind of changeability can also be seen in games where points shift around very easily, and where every point matters. 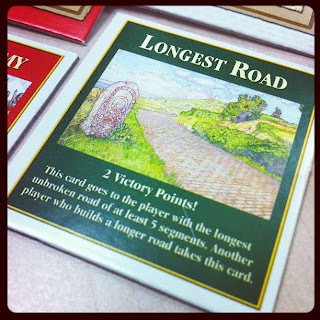 Catan's Longest Road card is an example of this because the points gained from it matter so much and it's so easy to steal, it can make the game a toss-up, even when one player has more points currently on the board than others. Anyone who has ever played Catan knows that this jerk makes or breaks games. A clever way to solve my cognitive dissonance problem with hidden scoring is to use a "grab bag" method sometimes when players get points. Instead of getting, say 5 points and taking 5 VP chips and placing them face down, a player might get 5 random chips out of a bag where 75% of the chips are 1 VP and 25% are 2 VP. Using a method like this, player cannot know how many points their opponents have, even though they see their opponents take the chips. This can be done as the sole scoring mechanism (although I haven't seen it done), or can be done in conjunction with other mechanisms, as in Settlers of Catan with Victory Points provided from the development deck. When drawn, these cards typically grant powers that are useful during the game. Occasionally, however, they are just Victory Points. This means that at best, I can only calculate my opponents' approximate scores, +/- the number of dev cards in their hand. Of course, this solution has other issues, like the increased role of randomness (if the chip point spread is high, and predictability if it's low). Perhaps the best of these methods is the "hidden goals" method in which each player has several cards that denote goals that will give them substantial VP bonuses at the end of the game, on top of the visible Victory Points they already have. Ticket to Ride exemplifies this method with the "Destination" cards. Each player tries to place the longest train lines throughout a continent. The longer the line, the more points it is worth. As in ITYOTD, players have a handy dandy VP track to help keep track of the points accrued from basic train lines. Up until this point, score is purely visible. 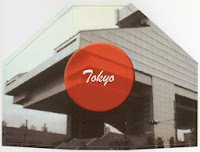 But on top of this, players start with several secret Destination Ticket cards that challenge them to connect specific cities with big VP bonuses at the end of the game if they've done it. This dual nature of the Victory Points, one visible and one hidden, allows players to fall behind in train line points but still believe they have a shot at winning from the Destination Tickets! Many games utilize this method of design to great effect. There is a problem with this method, though - since there are finite possible goals, players learn which goals there are over time - which is fine in a veteran vs. veteran game (in which each player can deduce what the others are going for), or in a newbie vs. newbie game (in none of the players know what the others want), but is problematic in a newbie vs. veteran game where this asymmetry can cause the veteran to win over and over and over, simply based on memorization of the cards. So there you have it! Some design options so that you needn't have purely hidden scoring or purely visible scoring and the problems that come with them. Thank you for this article! I totally agree that having hidden but calculable (or memorizable) scoring is inelegant, and it gives me the same feeling you have, that if we were playing this game at the highest level, we would keep track of the points, and that not doing so is a kind of laziness. I prefer games with fewer victory points, like Catan, Commands and Colors, and Battle Line. Another interesting example is Innovation, which groups victory points (influence points are converted to dominations). In some ways, this is similar to the scoring of tennis, where winning points leads to winning games, which leads to winning sets, which leads to winning matches. I wonder if more board games could be scored in this "nested" way. I was recently thinking about buying Ra, but it seems like a lot of my energy would just go into doing the arithmetic to figure out what my score might be, and that doesn't sound like fun.